The state government of Odisha is known for implementing unique and innovative schemes, which require the participation of common people, to bring about development of the society. 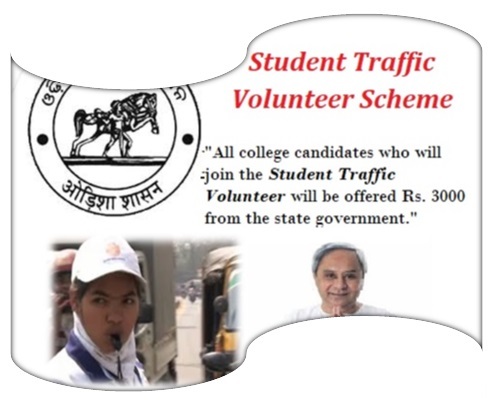 One such scheme is the Student Traffic Volunteer Scheme or STVS. As the name suggests, college students will be recruited by state traffic department as volunteers and will be given proper training to manage bust city traffic. By taking part in this scheme, college students will be able to serve the state and get paid for their service as well. Developing traffic in state – The main aim of this project was not only to incorporate college students in traffic maintenance, but also to impart vital information among the youth. With the assistance of these volunteers, it has also become easy for traffic department to carry out their duties. Government and private colleges – Students, studying in government as well as private colleges will be able to enroll under this scheme. They will work in unison with traffic police to maintain smooth flow on the busy streets. Uniform offered by traffic department – The traffic department will offer these volunteers with special uniform for carrying this task. They will receive a T-shirt as well as a cap. Training and briefing – Managing traffic may seem easy but it is not so in reality. To ensure that these volunteers can do their task perfectly, state traffic department will provide these students with adequate training. They will be briefed properly to ensure that they along with the commuters remain safe. Locations selected for this scheme – The scheme was originally implemented in Cuttack and Bhubaneswar. After recording an immense success in these areas, state government took the decision to start the same system in Sambalpur, Rourkela, Balasore, Berhampur and Koraput. Financial help to needy candidates – Several college students come from financially weak families. The money that state government offers to each volunteer, on a monthly basis, will allow them to meet a certain part of their expenses. Encouraging proper traffic norms – Teaching college students and engaging them in the task of traffic management will send a positive message. It will urge others to follow traffic rules as well. Experience for applicants – Apart from money and knowledge, these volunteers will also be able to gather experience in this task. When their term is over, the traffic department will also offer them a certificate for this service. All college candidates who will join the Student Traffic Volunteer will be offered Rs. 3000 from the state government. All applicants will have to manage traffic for three hours regularly, at a specific location. For their service towards the good of the state, Odisha government will offer Rs. 3000 as a token of appreciation. Lives in Odisha – This scheme is open for all applicant who stay and study in any college that is located within the borders of Odisha. There is no hard and fast rule that only those applicants will be able to fill in the applicant who have residential documents, issued by Odisha government. College student – Only college students will be allowed to fill in the application form, and perform the duties of a traffic management volunteer. Must have an active bank account – Since every volunteer will receive a monthly payment from the state government, he/she must have an active bank account in his/her name. Aadhar card – All applicants need to attach a photocopy of the Aadhar Card with the applicant form. It will offer traffic officers the candidates’ details. College certificate – As only college students can enroll their names under this scheme, they need to submit their college admission documents. Bank account details – As payment will be made via bank, applicants need to provide details like bank account number, bank and branch name, branch code ect. Providing a photocopy of bank account’s passbook will be enough. Any college student who is interested in being a part of this scheme will have to get in touch with the officers in their local traffic police station. From here, the students will have to get an application form. These forms will be offered to interested candidates free of cost. After filling in the details, mentioned in the enrollment form, applicants need to submit these in the same office. Selected candidates will be called for a personal interview. After this, suitable candidates will be recruited by local traffic office. The scheme not only puts stress on teaching youngsters about traffic rules, but offers them a platform from where volunteers can spread the same information to their peer groups. As more and more youngsters get the information and start following them, number of accidents, caused due to carelessness, will go down significantly. Staying alert on the roads will not only save the life of a person, but will also help him/her to save other from imminent danger. The state traffic management department will also be able to offer better service to common people.